This was a fun project that I had my students do in class. 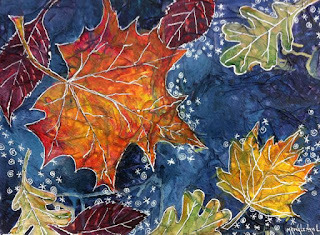 We took tissue paper and glued to watercolor paper using a 50/50 water/mod podge solution for a nice texture. 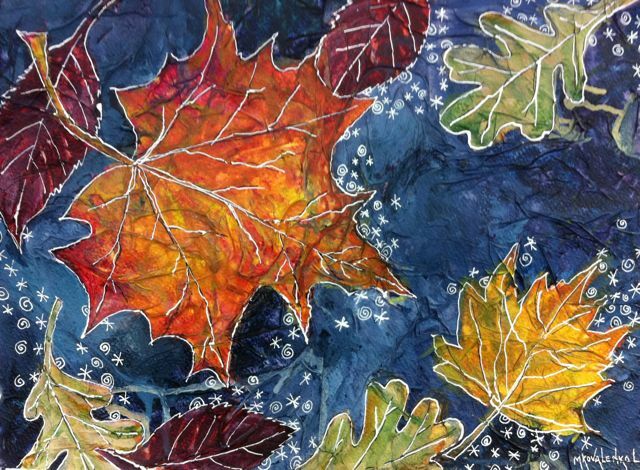 After it was dry we painted leaves and I chose a dark background. Spray to seal and then ink over it. It sure does feel like November to me. September 2017 - After 10 great years of teaching at my studio, Room 101, an Art Studio in Mars, I decided cut back on my daily teaching schedule, and go back to my personal painting. I am looking forward to this time! Feel free to contact me for purchase, commission or workshop information.